Our objectives in this paper are to carry out a study to evaluate recent trends in the tourism industry, analyze Cuba’s perspectives and quantify the economic impact of tourism policy and activities on the island’s economy. The task entailed not only an assessment of Cuba’s specific conditions, but also positioning Cuba within the broader Caribbean context and the major trends and perspectives affecting the industry. The economic impact of tourism is a key component of the study. In order to arrive at a conclusion, we analyzed the income and employment generating capacity of the industry and the fiscal resources which it generates. 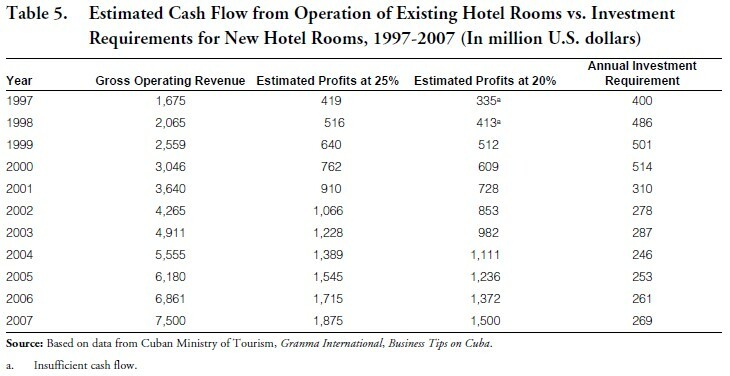 The conclusion arrived at in the study is that the operation of tourism, hotels, motels and other related assets represents a growing major contribution to both foreign currency income generation and employment in Cuba and that it will play a major role in the coming years based on the number of hotel rooms under development, the investment required and the potential impact on the economy during construction and operation. Cuba’s tourism industry is faced with challenges arising from new competitors and from a rapidly changing global tourism industry. This report suggests that Cuba could position itself to face these challenges successfully and generate major economic benefits for its economy through coherent demand and supply- side policies. However, Cuba’s tourism industry is not demand driven. The Cuban authorities determine what and when new supply will be developed, sometimes with unorthodox criteria. Demand for these products is expected to be created by the foreign operators and wholesalers. Using the available official figures as the base for the tourism strategy, we attempt in this report to estimate the economic impact of the island’s tourism industry ten years from today, in 2007, according to two scenarios. The first scenario assumes continuation of the current political and economic situation, perhaps with minor changes. The second scenario contemplates the complete elimination of political and economic barriers in a free capitalistic economy where American citizens and residents as well as Cuban citizens will be able to invest, operate, visit, and enjoy any of Cuba’s tourism facilities. The report suggests that there is an abysm between the two scenarios. However, it also indicates the tremendous opportunity that Cuba has to benefit all players, including the Cuban people, by improving its current political, economic and labor policies and allowing free enterprise and demand to lead the growth and success of its tourism industry. International tourism has been a major contributor to the expansion of the world economy in recent years. According to the World Tourism Organization (WTO), international tourist arrivals increased by 3.6% in 1995 and by 4.5% in 1996, and will continue growing by 4.6% per year until the year 2010, while international tourist expenditures measured in U.S. dollars rose 13.1% in 1995 and 7.6% in 1996. Tourism expenditures will grow at a pace of 6-8% above inflation. The Organization for Economic Cooperation and Development (OECD) points out that tourism is one of the three main sectors of trade in international services, as higher education, more leisure time and consistent growth of employment and personal income are inducing more people to travel and to explore new regions. Although most European countries are highly industrialized economies where manufacturing, agriculture and services play a balanced economic role, the ratio of tourism expenditures (revenues) to the Gross National Product is quite significant in most of them: 6.6% in Austria, 4.5% in Spain and 4.1% in Greece. The world’s top tourism destinations in 1996 were France, United States, Spain, Italy and China. International tourist arrivals in France reached 61.5 million, 44.8 million in the United States, 41.3 million in Spain, 35.5 million in Italy, and 26.0 million in China. There is a clear consensus among world tourism organizations, travel industry associations and macroeconomic consulting firms regarding the future of tourism and world travel. Steady and sustained growth is anticipated for 1997 and the foreseeable future extending to the year 2000. In a revised forecast announced mid-1996, the WTO predicts that international tourists, which amounted to 566 million in 1995, will grow to 702 million in 2000 and to 1,018 million in 2010, while tourist international expenditures will climb from $393 billion in 1995 to $526.5 billion in 2000 and $620.5 billion in 2010. • During the period 1995-2000 world tourism measured in terms of trips, real spending or nights abroad, will grow faster than in the period 1989-1995. The latter period was negatively influenced by the 1991-1992 world economic recession. • During the period 2000-2005 the expansion of world travel will decelerate somewhat but still remain faster than in the period 1989-1996. • Long-haul travel to the Caribbean, which grew at an average annual rate of 6.5% during the 1989-1995 period, will accelerate to 8.2% in the period 1995-2000, reflecting a 6.3% average annual growth rate. • During the period 1995-2000 long-haul trips to the Caribbean will grow 8.2% per year, a rate which will be surpassed only by Australia/New Zealand (11.7%) and North America (9.8%). • The Caribbean’s share of total long-haul travel will increase, mainly due to significant rise in travel from European countries, especially Austria, Germany, Italy, Spain, the Netherlands and Switzerland, this compensating for a slight decline of travel to the region from Canada and the United States. • Longer term trends in Europe and the United States should favor continued growth of travel to the Caribbean during 2006-2010, as growing incomes and increased leisure time enlarge the pool of potential travelers. However, the ability to capture a rising share of this growing pool of travelers will depend on continued improvement in attractions, as competing locations around the world will be vying for a larger market share. For a country to remain competitive in the international tourist market, its public authorities and the leading components of the private sector (hotels, recreational facilities, airlines, transportation systems, advertising agencies, etc.) must adapt to the challenges of the changing macroeconomic situation, environmental and security issues, higher emphasis on total quality of tourist services, diversification of tourist products and increasing competition among countries and destinations. Quality of tourism has become a dominant strategic element. It means improved tourism supply, better educated staff and more efficient distribution of tourism flows both in time and space. Moreover, tourism has become a carefully planned economic activity that demands inputs from all sectors of society. For instance, the French government regards tourism as a separate economic sector with all the features of an industry. This has led to a complete reorganization of tourism activities in France, oriented by three priorities: a strategy to facilitate growth of French tourist products, the implementation of a policy to support tourist enterprises and full coordination of actions abroad. For the purpose of this study we address the Cuban economy only with regard to the tourism industry and its ramifications into other activities. As a result of the demise of the Soviet Union, significant changes occurred in all the countries of the Soviet bloc in Eastern Europe. The economic support provided by the Soviet bloc to Cuba dried up, forcing the Cuban government to declare a “special period” and to change its approach to the new situation. The full employment policy could not continue without the Soviet support. The Cuban regime saw in the development of tourism an opportunity to use an enormous labor force, qualified, but idle. Even today, Cuba’s work force is 45% unemployed or under-employed. Two principal advantages of the switch to tourism as a major economic activity are: 1) the tourism product is renewed every 24 hours with minimal additional investment; and 2) tourism is a labor-intensive industry whose workers in the majority perceive directly or indirectly incentive remuneration in addition to a base wage or salary. This is a unique change in Cuba after many years of repudiation of the “gratuity” or propina as counter-revolutionary. Badly needed resources were dedicated to the construction and rehabilitation of tourism installations and lodging facilities. Several joint ventures with foreign hotel companies were arranged through diplomatic channels and directly. Many carpet baggers flocked to take advantage of the confusion and the lack of experience of the authorities on tourism matters. The vertical reporting and decision making system of the Cuban regime, on the other hand, provoked desperation, frustration, and great expense to the bonafide business person. However, once the relationship was established and a sense of trust developed, the subsequent negotiations became quasi/normal and effective for both parties. Tourism in 1996 surpassed the sugar industry as a source of hard currency in Cuba. This is due to the dramatic increase in activity indicators in the tourism industry and to concurrent decrease in production in the sugar industry. The 1996 total tourism revenue amounted to $1.4 billion, while hard currency receipts from the sugar industry in the same period were about $1.2 billion. Table 1 presents Cuban Ministry of Tourism statistics on number of available hotel rooms, visitors and total annual revenue received from tourism. 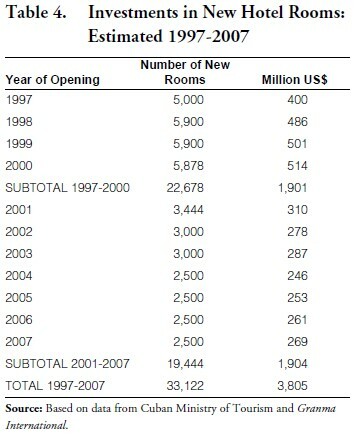 Cuba’s performance during the 1990-1997 period regarding growth in rooms inventory, visitors, and gross tourism revenue, although all following an upward trend, grew at different rates as indicated below: 18.45% average annual increase in the number of rooms, 31.61% average annual increase in the number of visitors, and 73.53% average annual increase in gross tourism revenue. 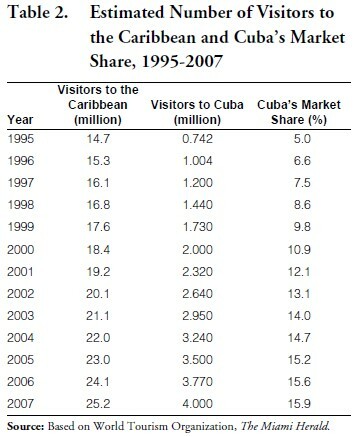 These statistics are indicative of improved performance by Cuba as a tourist destination. There is no doubt that the Cuban regime is committed to the further development of the tourism industry. Not only is Cuba committing substantial additional funds, including contributions by joint venture partners, but is also introducing new products to diversify the supply segments in preparation to an eventual opening to new markets, including North America and this region’s enormous source of tourism demand. The goal regarding availability of hotel rooms in the year 2000 of Cuba’s Ministry of Tourism is 49,556 rooms. In an effort to analyze tourism industry activity in Cuba and its impact beyond the Cuban Ministry of Tourism’s goal for the year 2000, we have considered two defined scenarios. • First Scenario: Assumes the continuation through the year 2007 of current political and economic system, perhaps with minor changes of minimal impact. • Second Scenario: Contemplates the complete elimination of political and economic barriers, both internal and external. A free capitalistic economy where American citizens and residents as well as Cuban citizens are able to invest in, operate, visit and enjoy any of Cuba’s tourism facilities and to develop any enterprise to support the tourism industry in particular, and to satisfy the growing consumer demand for better products and services. The two scenarios are defined in more detail in an accompanying box. Why 2007? We believe that ten years from today is far enough into the future to achieve sufficient changes to modernize the obsolete planned economy and political system where government owns and exploits all resources in the Island, including its human resources. Moreover, we chose to project ten years into the future to avoid the analysis of the numerous variables, issues, theories, and suggestions for effecting changes in Cuba. This way we do not cloud the purpose and methodology of our study with political issues. Table 2 presents a comparison of the estimated growth of tourist arrivals to the Caribbean as forecasted by the World Tourism Organization versus ours through the year 2007. Cuba’s share of the visitors to the Caribbean, 7.5% in 1997, will double by the year 2007 to 15.9%. This suggests that visitors to Cuba will not only grow in terms of number of persons—to an estimated four million by the year 2007—but that Cuba will penetrate the market more intensively than its fair market share. These projections do not contemplate the opening of the U.S. market. This means that Cuba continues taping the European and Latin American markets. The projected growth in the number of hotel rooms (Table 3) reflects the Cuban Ministry of Tourism’s goal of 50,000 rooms by the year 2000. In order to achieve this goal, Cuba will have to build more than 5,000 hotel rooms each year during the years 1997 through the year 2000. Our projection of new hotel rooms through 2007 averages 2,800 hotel rooms openings per year. The rush to create a critical mass of tourism rooms is a priority in the Cuban Ministry of Tourism’s strategy. It is obvious that in recent years Cuba has experienced difficulty in obtaining long range financing due, in part, to its failure to perform timely in on-going loans. Short term financing at a higher cost is a problem that Cuba has to manage promptly. Table 4 presents the estimated cost of new rooms additions at the time of their opening to the tourist public. Costs are calculated based on general information of the Cuban Ministry of Tourism adjusted by inflation. The cost of new properties will increase with the improvement in the quality of such new products. The planned addition of 22,678 new rooms during the period 1997-2000 will have a total estimated cost of $1.901 billion at an average annual expenditure of $475 million. For the period 2001-2007 the addition of new rooms will grow at a slower rate. The addition of 19,444 new rooms is estimated to cost $1.904 billion, which represents an annual average investment of $272 million. Table 5 presents simulations of gross revenues and earnings of Cuban tourism activities, compared with the estimated cost to develop the planned new room additions. We beg the reader’s indulgence as it is obvious that the timing of the elements and activities in the chart are not concurrent. However, the chart demonstrates that the new rooms could be financed from the cash flow produced by the existing properties. It is expected that, due to more imminent needs of funds in other economic sectors, the Cuban Government would re-invest less than the totality of the cash flow in the tourism sector. This would cause short term borrowing and increase in the final cost of future units and in the operation of the existing units. The two levels of profits are used to provide a range of “normal results” in the industry. The estimates reflect results before payment of management fees and share of profits to join venture partners. Table 6 presents our estimate of tourism statistics in the year 2007. They have been developed under the two defined scenarios and the difference in units and percentage of each activity indicator. No matter how much disagreement we may find in regards to the significance of the contribution of international tourism strategy to the solution of Cuba’s economic woes—or as to the real intentions behind such a big push—there is no doubt about the fact that Cuban authorities have made a strong, concerted effort to expand both the supply and the demand sides of the tourism market. • Since they are classified as exports of services, they may improve the balance of payments of the country. • Generate revenues for the government in the form of departure taxes, hotel occupancy rates, taxes on tourist expenditures, import duties, corporate repatriation (toll-gate) taxes, and so forth. • Expand the income and employment opportunities of local citizens and induce a multiplier effect that benefits commercial, financial, industrial and service concerns all over the economy. • Government revenues, business and personal income and savings, generated in tourism may be used to improve infrastructure (roads, airports, telecommunications, etc.) as well as economic infrastructure for all kinds of economic activities, which in turn contributes to overall economic development. • Education and training of human resources to meet the high quality service standards of international tourism. • Promotion and publicity costs that should compete in style and quality with those of world class destinations. • The cost of capital to develop the portion of the supply side controlled by government (hotel construction, equipment, maintenance requirements, etc.). • Expenditures abroad to attract foreign investors and foregone government income in case that tax incentives are used to attract foreign firms. • Environmental costs of new tourism developments. Being essentially beach oriented in the Caribbean region, the building of tourist hotels sometimes is done at the expense of prime habitat for animals, some of them endangered species, coral reefs, water tables and underground waters. • Tourism may be accompanied by undesirable social problems such as drug traffic, illegal gambling, illegal trading of commodities and prostitution. Several important elements could be added to the benefit and cost lists just enumerated but the essential elements have been pointed out and the research problem is quite clear: How can we develop reliable data to conduct a cost-benefit analysis of Cuba’s international tourism initiative, in order to evaluate its progress so far and project its future impact? In her research, María Dolores Espino has developed a very important argument in regards to the multiplier effect of tourism expenditure in Cuba: the present policy of keeping the tourism activity separate from the rest of the economy hinders both the expansionary effect of the income (we may add and the employment) multiplier and discourages linkages between tourism and other industries.3 It seems that Cuba lacks an input-output matrix that may allow to calculate reliable income and employment multiplier effects. Using data for 1988, Espino makes several mathematical calculations that lead her to the conclusion that “the total impact of tourist expenditures on the Cuban economy is probably not much larger than the direct income and employment that these expenditures create.” Of course, this remains a preliminary statement until harder, much more detailed data is available. Using Puerto Rico’s employment, production and income multipliers for tourism hotels, 4 derived from the 1982 input-output table, the impact of economic impacts of the two scenarios can be calculated. As is clear from Table 7, the differences in the two scenarios is vast in all categories, with the second scenario providing much more positive results. The cost of Cuba’s tourism is very difficult to quantify, given the lack of specific, item by item, figures. Cuba has developed hotel and hospitality training schools, has invested substantially in international promotion and publicity campaigns, especially in Canada and several European countries, and has established at least 20 mixed enterprises and several joint ventures with foreign companies to develop tourism facilities. 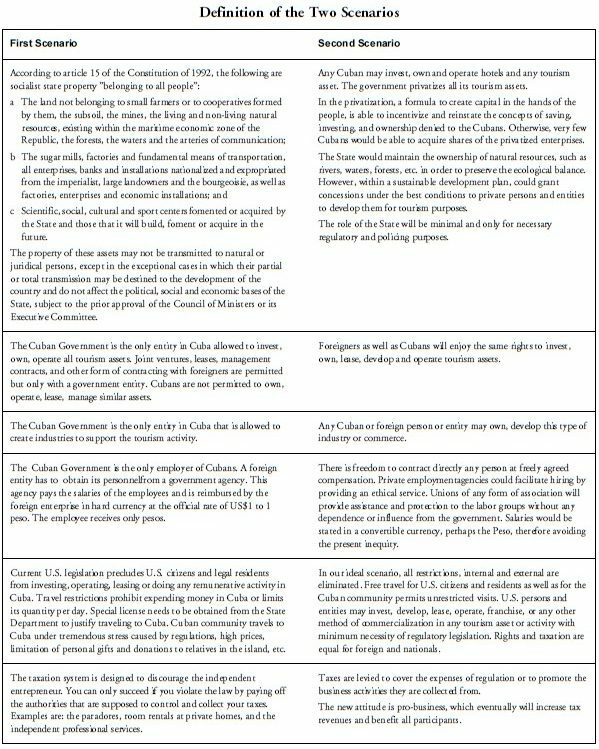 The broad, vague figures that Cuban authorities use to describe their strategic actions should not be taken at face value, but they are the only information available, unless further research discovers ways to gather more detailed and trustworthy information. Environmental costs are difficult to calculate even in open, democratic societies, where sometimes both the government and private companies share the same nondisclosure tactics. We may guess that international environmental organizations making research in Cuba may come out with information about the environmental cost of developing tourism activity at the apparently unsustainable rate that Cuba has been following lately. Finally, the social cost of tourism have been widely discussed be Gert Oostindie,5 Jaime Suchlicki,6 and other researchers and some policy statements by Cuban government officials show a deep concern for the socially undesirable effects of economic dualism, which clearly discriminates against persons not having access to dollars and depresses the incentive to work of persons locked in the traditional socialist sector of the economy. In sum, the economic assessment of Cuba’s international tourism strategy is a major task that faces nearly impossible obstacles, but should be a top priority in any research of the economic future of the country. On the basis of available information, there is no way of telling if the strategy is going to prevail in the future, but it is quite obvious that the Cuban government has engaged in a high risk but potentially rewarding business adventure. The short-run success of the strategy so far seems to be based on low prices, given the low salaries prevailing in Cuba, but such competitive advantage may gradually disappear in the future if local economic conditions improve and workers begin to demand higher benefits for their efforts. In the long-run, Cuba will need to upgrade significantly the quality of its tourism services and facilities in order to remain competitive in the tourism market, even if it retains some degree of cost advantage in regards to salaries and wages. International tourism is a major accelerator of economic and political change and an effective promoter of knowledge about other cultures. In the long-run, Cuba’s enclave approach to tourism may become a limiting factor, especially if other types of tourism activity—ecotourism, cultural tourism and adventure tourism—which have been highly successful in many other Caribbean destinations, are adopted as strategies to boost tourism expenditures. Such new trends require wider closer interactions of tourists with the local social and cultural environments, which will translate into much higher income and employment multiplier effects that will increase the economic returns of tourism for the Cuban government and for the population in general. If economic rationality prevails, the future development of tourism in Cuba may be not only a spearhead of economic development and significant source of foreign exchange, but also influence in the promotion of political change towards the free exchange of ideas and democracy. A market assessment and economic impact analysis identified key factors about Cuba’s competitive market position, forecast of future hotel supply and demand trends, and economic impact of tourism in Cuba. The forecast results contained herein are solely the product of the author and participants in the study and is significantly based on official information derived from publications and the Cuban Ministry of Tourism. In this study we only compare two economic scenarios limiting ourselves to the minimum in our critique of the official data and activity indicators that are neither consistent nor reliable. The number of tourist arrivals to Cuba increased by 262,300, or 35%, between 1995 and 1996, to a total of 1,004,000 in 1996. The Cuban Ministry of Tourism estimates an increase of 196,000 in 1997 to a total of 1,200,000 visitors, which represents an increase of 20% over the previous year. Furthermore, by the year 2000 the official estimate of visitors at 2,000,000 represents a 20% annual increment in the number of tourist arrivals. Our estimates and professional experience indicate that by the year 2007, Cuba will double its number of tourist arrivals and will reach the 4,000,000 level. 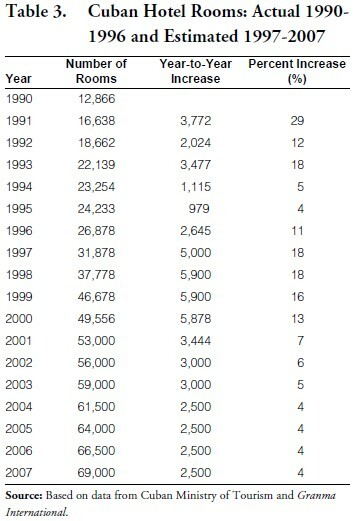 Total visitor expenditures in 1996 at $1.4 billion, increased $300 million, or 27 percent over 1995. Total visitor expenditures for 1997 is estimated at $1.675 billion by the Cuban Ministry of Tourism. According to the study results, we projected visitor expenditures to grow to $3.046 billion in the year 2000 and $7.5 billion in the year 2007. According to official estimates, 68,000 visitors seek accommodations in private homes in a semi-clandestine way. While this practice is legitimate in other countries, the Cuban authorities consider it as “unfair competition against the hotels” and has initiated a tax system that may eliminate many of the underground hoteliers. Another entrepreneur that is opposed by the authorities and might be soon listed within the endangered species is the buquenque, an intermediary, ad lib travel agent, or broker that procures clients to the private homes. Although it is estimated that these activities represents about $20 million, we are not considering them significant enough to affect our estimates and calculations. We consider that Cuban citizen residing in Cuba have no significant impact in the growth of participants or users of the tourism facilities. Under the first scenario they will continue being excluded from the tourism facilities as they are today. The hotel room supply in Cuba, particularly in the tourism sector, increased by 2,645 new hotel rooms in 1996, or 11%, to a total of 26,878. For 1997 the Cuban Ministry of Tourism is planning to develop 5,000 new hotel rooms. This effort, if sustained, would make a reality of the Ministry’s goal of operating 50,000 hotel rooms by the year 2000. An average of 5,900 new hotel rooms per year would need to be constructed between 1997 and the year 2000 in order to meet this ambitious goal. We estimate that an annual average of 2,500 to 3,000 new hotel rooms will result in an inventory of approximately 69,000 hotel rooms in the year 2007. To calculate the average hotel occupancy in Cuba from the official activity indicators is a difficult task. Our review of a substantial number of official documents, publications, speeches, press releases, etc. do not reveal reliable national data. Only the individual hotel enterprises publish sporadic data, mainly when it is good news. The properties operated by recognized quality international operators normally enjoy occupancies ranging between 75 and 90 percent, and in a few cases even higher. Our best professional estimate indicates that at a national level, occupancies have been approximated 64% in 1987, 73% in 1995, and 75% in 1997. These occupancy rates will decrease as a result of the aggressive new hotel room construction announced by the Cuban Ministry of Tourism. They will level off after this construction fever subsides. In our annual projections through year 2007 we assumed occupancy rates of 66.7%. The gross cost of development of a new hotel room in the four and five star category was estimated by the Cuban Ministry of Tourism at US$80,000. This is a moderate figure by international standards, particularly in resort locations. Our estimate of the investment required to meet the planned increase of hotel rooms inventory goal of 50,000 rooms in the year 2000 amounts to $1.9 billion. This represents an increase of 22,678 hotel rooms during the period 1996-2000. In addition, our estimate of growth for the period 2000-2007 at 10,444 new hotel rooms requires an additional $1.9 billion of investment. The Government of Cuba is becoming one of the largest hotel owning companies in the world. Without analyzing Cuba’s motivations and peculiar foreign investor arrangements and its labor, political, and social ambiguities, it seems to be able to continue supporting its tourism industry growth. With a current base of 174 hotels and 26,878 hotel rooms it seems to be able to produce enough cash flow to support the ambitious development program, as it is shown in this paper. • Cuba, by maintaining its present socialist political and economic system is shortchanging the Cuban people from the opportunity to invest and benefit from the exploitation of its national resources. The monopolistic system precludes, the Cuban people from enjoying and benefiting from the economic multipliers and their ripple effect that their work might create. • This situation is critical in the tourism industry because of its particular intensive labor characteristics. • Our analysis of the tourism activity indicators for 2007 and a simulation using the Commonwealth of Puerto Rico’s income and employment multipliers demonstrate a substantial lack of economic benefits in the tourism activity in Cuba when we compare the two scenarios. To conclude, by maintaining the status quo, Cuba is reducing its potential gain from international tourism by at least several million U.S. dollars per day. 1. The authors would like to thank the members of the Cuban Society of Tourism Professionals, particularly Marie L. Dexter, José A. González, Saturnino Lucio II, José A Menéndez, Margarita Navarrete, Roberto Pérez and Roberto Arencibia. 2. DevTech Systems, Cuba Monthly Economic Report (May 1997), p. 2. 3. María Dolores Espino, “International Tourism in Cuba: An Economic Development Strategy?” In Cuba in Transition, p. 216. Miami: Florida International University, 1991. 4. The production multiplier indicates how much production (defined as intermediate plus final sales) is needed to satisfy one dollar of final demand concerning any industry included in the input-output matrix. The employment multiplier shows the direct and indirect employment generated in the economy for each direct employment created in a particular sector or industry. The income multiplier shows the direct and indirect income generated by a unit of final deman required from a particular sector. 5. Gert Oostindie, “A Loss of Purpose: Crisis and Transition in Cuba,” paper presented at the 1995 Utrecht University Conference entitled Societies of Fear, 34 pages. 6. Jaime Suchlicki, “Cuba: A Current Assessment” (1997).